The NRA has named John A. Nosler the winner of the inaugural NRA Golden Bullseye Pioneer Award. “Mr. Nosler was the unanimous choice of an eight-member selection committee, acting on behalf of NRA members nationwide”, said NRA Publications Executive Director Joe H. Graham. One of the world’s foremost innovators in ballistics and bullet design, Nosler invented the Partition and other custom bullets. He pioneered the premium bullet category that has been widely adopted by big-game hunters, and has influenced bullet manufacturers worldwide. 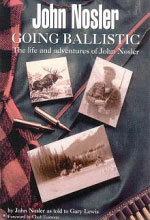 To learn more about John Nosler and his bullet designs, get your hands on Going Ballistic, a “Professional Memoir” told by John Nosler to outdoor writer Gary Lewis. With over 150 photos, and many fascinating accounts, this book is available from Sun Publishing for $24.95. CLICK HERE to read a short sample from Chapter 11, “Penetration and Expansion–The Need for a Better Bullet”. The John A. Nosler Endowment of The NRA Foundation, funded by Nosler Inc., sponsors the NRA’s Basic Rifle Training Program. Share the post "John Nosler Honored with Pioneer Award"